I am always pleased to see that the two “most viewed” posts here at Petrona each week continue to be the two short reviews I wrote last year about Norwegian and Swedish crime fiction. I am so glad that people are interested in books from these regions and, it is to be hoped, go on to read some of them. My posts, of course, are brief, so potential readers are only getting a small snapshot from them. DEATH IN A COLD CLIMATE is the perfect book for those who have sampled and enjoyed a little Scandinavian crime in fictional form – Stieg Larsson, perhaps, or Jo Nesbo – and who want to find out what more the region has to offer. 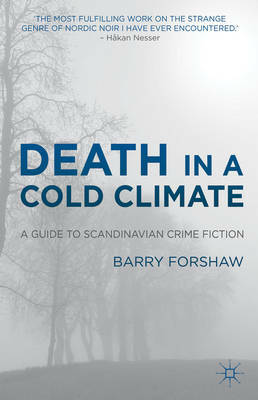 Barry Forshaw is the best-known “talking head” in the UK on crime fiction, and here he provides a short monograph which takes the reader on a whistle-stop tour round Sweden, Norway, Iceland, Denmark and Finland, showcasing mostly authors who are writing today, but mentioning a few older names in the process. Many excellent authors are discussed in this book, not only by Barry Forshaw but in informative, substantial excerpts by the book’s authors and translators. It is truly fascinating to read Sarah Death, Don Bartlett, Marlaine Delargy, Laurie Thompson and others in their own words, on how they go about their work and how they make the end product read as authentically as possible. I highly recommend this book as a good summary of the output of some of the main authors writing today in the Nordic countries. The contents provide an effective introduction to many authors, so will probably be enjoyed more by those who have not read many of their books, rather than by those who are already very familiar with them. For comprehensive bibliographies, in written order (rather than translated order, which is often very different, unfortunately), I recommend the Euro Crime database. Links to the Nordic countries are here: Denmark, Finland, Iceland, Norway and Sweden. More details about the book at the publisher’s website. Crime Scraps Review on the reasons for the success of Nordic crime fiction. Other reviews of Death in a Cold Climate: The Independent (by translator Anna Paterson), Financial Times (by author Mons Kallentoft), Bookgeeks (Mike Stafford), and Martin Edwards. There are two knowledgeable reviews on Amazon that I enjoyed, by Brian J. Cox and Simon Clarke. Shotsmag Confidential: Barry Forshaw on “becoming an authority” on Scandinavian crime fiction. Thanks for this note about Barry Forshaw’s book. If I can get myself out from under here, I’ll read it, especially the parts written by the translators. I have an interview once with Sian Reynolds, who translates Fred Vargas’ books; it was fascinating. Must get back to reading Scandinavian crime fiction, if only to escape the political situation over here. It’s a non-fattening, healthy means of escape. Sounds like an excellent starting point for the uninitiated (like me!). Does he offer any explanation why Scandinavia has (apparently) suddenly started producing such good quality crime fiction, Maxine? Based on what is being translated now that I’ve seen, we’ve already had the best authors! Many of the “newly writing” authors seem quite derivative and/or sensationalistic, from the sample I’ve either read or started to read and stopped (or glanced at and decided not to read)! Thanks Maxine, I suspected as much. There seems to be so much at the moment – I did wonder if the band wagon was taking on a few extra passengers! And I heard once that the UK has a general reticence in terms of translating anything. That was a few years ago now though, so not sure if that’s still true. I think you are right about the reluctance to translate, as it adds an extra level of cost. Some translations are done with support from various countries’ Arts councils (a lot of Nordic is done this way) but for a commercial publisher it was always considered an extra risk. However, if a book has done well in another market, it is less of a risk I suppose – many Nordic books get translated into German, do well there (as Germans love crime fiction) and then get a UK translation. This is part of the reason for the big time-delays. BTW there are some good new Nordic writers! My posts (links in post above) mention a few if you are interested, eg Camilla Ceder. But in the main, in 2012, I am enjoying new books by established Nordic writers rather than new books by new Nordic writers. Thanks for the review Maxine, I have this on my shelf to read. I will be interested to see if I fall into the camp of a reader who knows a little about Scandinavian CF or someone who is knowledgeable. I think I will be someone in the middle so I am looking forward to reading the book to fill in the gaps! Thanks, Sarah. I think you’ll like the authors’ and translators’ perspectives, whichever category you fall in! Good to mention Hakan Nesser’s writing. I had read two books by him, which were fine and then read The Inspector and Silence; it was quite good and unputdownable. Thanks, Kathy, and just to note, I don’t think it will affect your view of Barry Forshaw’s book too much, but as I noted in my review, it is a survey of UK translated novels, ie American translations are not included. Many books are translated in both countries, but some are not (some are US only eg Inger Frimansson, Helene Tursten) and some UK only (though you can buy US editions in the UK, or vice versa, at a premium!). Speaking of Tursten’s book, I’ve read three and now I’ve opened Night Rounds and can’t seem to get past 10. I don’t know why that is. The writing isn’t pulling me in; it’s not interesting. Irene Huss isn’t center-stage. Something is off. From the reviews I’ve seen so far, Night Rounds is not as good as the previously translated titles, Kathy. Still isn’t available here yet, but I’ll no doubt be reading it when it is. It was a good post, Norman. And I think it does show that a lot of people are searching for books from this region. I very much appreciated this review and want to get a hold of it–looks like I’ll need to purchase it. I should also check Palgrave’s list. I own several Palgrave books of criticism about contemporary German literature. I hadn’t really thought about crime in Scandinavian countries until Girl With a Dragon Tattoo came out. This sounds like it might be interesting.